When it comes to systemic inflammation, the Omega Ratio is very important to acknowledge. 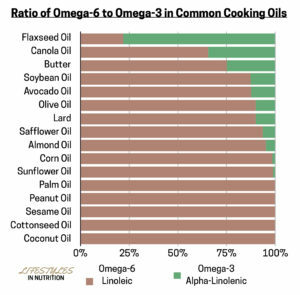 While the Omega Ratio shows that our dietary intake of omega fats should be around 3 to 1, Omega-6 to Omega-3, many of the oils used in cooking and baking are heavy on the inflammatory Omega-6 side. The more of these oils we eat, the harder it will be to rebalance our dietary Omega Ratio with dietary omega-3s or even with omega-3 supplements. Inflammatory oils can disrupt our body’s ability to regulate the inflammatory process and inflammation may cascade out of control. 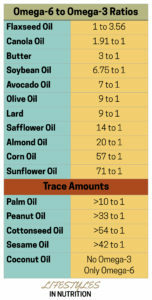 The table below shows the ratio between Omega-6 and Omega-3 for 11 everyday fats/oils. Five oils with too little Omega-3 to impact our dietary ratio are listed in the bottom. Remember that the ideal dietary ratio is about 3 to 1. The graph shows these ratios more visually including the saturated fat and monounsaturated fat content. The top oils used in processed foods come from canola, soybean, safflower, corn, and sunflower. Soy is a little heavy on the omega-6 side, safflower is relatively heavy on the omega-6 side, and corn and sunflower oils are very heavy in omega-6 and ultimately provide little to no omega-3 fats. On the flip side, canola is the only major oil that rebalances the omega fats to create a more anti-inflammatory effect. The downside is the worry about genetically modified (GMO) canola (rapeseed) which is used to make non-organic canola oil. For that matter, oils from corn, soy, and cottonseed are also likely to come from genetically modified versions of the plants. Some people prefer to avoid GMO versions of foods for environmental reasons, and some claim major health issues from GMOs so these oils may not be suitable for you. Organic versions of these oils are supposed to be non-GMO and would avoid any concerns about GMO foods. Well, flaxseed, butter (from grass-fed cows), avocado oil, and olive oil seem best when addressing your Omega Ratio. If organic canola oil doesn’t scare you off, then this could also be useful in your oil cabinet. Flaxseed has more omega-3 than omega-6 so people can use it as a daily nutraceutical or food supplement to correct chronic inflammation due to omega imbalance. However, I’d save the regular use of flaxseed oil for the ladies because flaxseed oil may correlate with or even perpetuate prostate cancer. Interestingly, butter has the ideal Omega Ratio! Butter from grass-fed cows will have more omega-3s than conventional butter and a stronger anti-inflammatory effect. Don’t be afraid of butter from grass fed cows. Unlike processed butters from conventional animal products, butter from grass fed cows are a net positive for our health when used in moderation. Finally, I would include coconut oil in my healthy oil ensemble. Although coconut oil provides essentially no omega-3 fats, it also provides almost no omega-6 fats either. This means that coconut oil isn’t going to have an impact on our Omega Ratio. 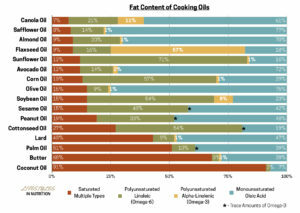 The graph below shows some of the oils and fats that have very little to no omega fats like coconut oil. You can also see the proportion of that oil that is saturated, monounsaturated, or omega-3/omega-6. As you can see, flaxseed oil and canola oil provide the greatest portion of omega-3 fats than any other oil. Keep in mind that the whole foods that we derive these oils from may have little to no impact on the omega ratio because in the unprocessed food form there can be very little oil per serving. It’s only when we extract the oils out that we get significant doses of the fats including the omega fats. So don’t worry so much about sunflower seeds, corn, almonds, peanuts, and sesame seeds. Eating these foods in their whole food form, especially organic, can support a healthy diet.